According to my Steam statistics, I've played approximately 162 hours of Just Cause 2, a significant portion of which was spent grappling members of the Panauan armed forces to lit fuel containers to make them zoom away like man-sized Roman candles. Avalanche Studios' open-world magnum opus seems to nail what larger franchises like Grand Theft Auto forgot years ago: the most fun you can get from a sandbox game is in blowing large parts of said sandbox to smithereens. So it's no wonder that the sequel, Just Cause 3, is making waves months before its release. 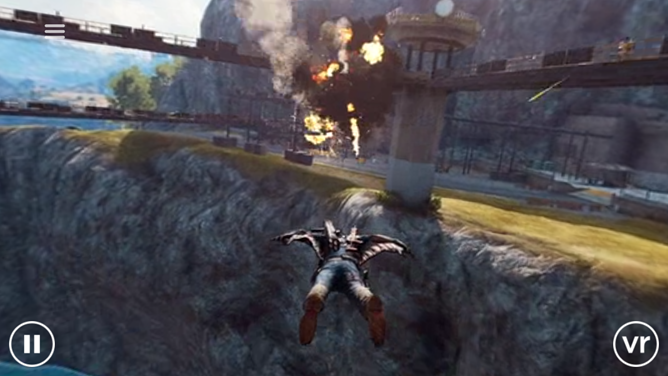 In addition to the standard shooting/driving setup and the unique parachute/grapple hook mechanic of the previous game, the third entry will give players infinite batches of C4 explosives and a wingsuit for even more ways to traverse the massive game world. To drum up a little more excitement before the December release, publisher Square Enix has released a VR app for Android that lets you play around with the wingsuit. Well, sort of. It's more like you get to ride along with protagonist Rico as he blows the crap out of various locations while never touching the ground. (Infinite C4, y'all.) But the rendered video shows some of the core gameplay in 360-degree glory, and if you don't happen to have a Google Cardboard or similar headset, you can watch the video in full screen and still get the omni-directional experience. There are also a handful of extras thrown in for more marketing points. Man, December cannot get here fast enough - I can't wait to knock someone off a motorcycle with a mid-sized sedan tethered to a helicopter once again.